7/8" Italian Mosaic Tile, 5lb. Lustrous Colors for Mosaic Pictures. Highly glazed finish in assorted solid lustrous colors for mosaic pictures. Approximately 90 pieces per lb., or 450 per 5-lb. bag. 7/8". 5mm thick. I used this for a middle school art project. The colors were more vibrant than I anticipated and the students really enjoyed working with them. They also enjoyed doing the math to figure out exactly how many they would need to cover that area. Do the math before you order and you'll have enough! A useful addition to general mosaic stock. These high fired tiles have proved durable in outdoor mosaic projects such as step stones here in Seattle - average winter temp. 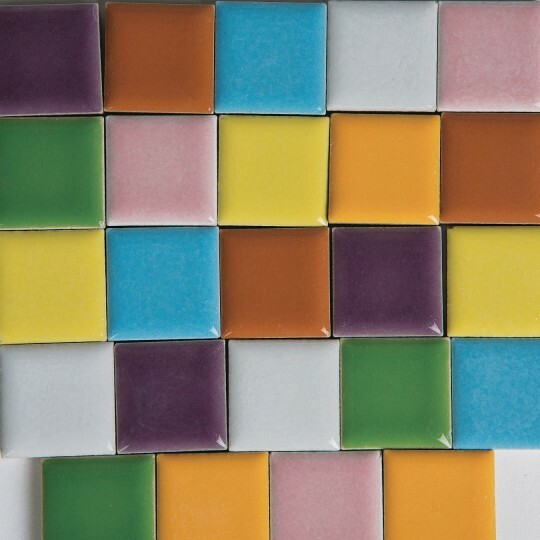 of 30-40 degrees along with SS's other ceramic tiles The limited variety of colors may leave you wishing for a mix with more pizazz. Past orders have had five main colors: white lt. blue pink pale custard yellow and brown. You may get a batch with some blue-green pale green med. or dark blue or purple. Treasure the occational red. 1" Heart Shaped Tile, 1-lb.